SecurityStockWatch.com: Thank you for joining us today, Dave. It’s a pleasure to speak with you at this exciting time when the combination of HD and IP is such a hot topic. Before we get into the details of Pelco solutions and the new Spectra HD product family, please give us an overview of your background and your role at Pelco. Dave Stanfield: Thank you. It’s a pleasure to be here. I’ve been with Pelco for more than 14 years, holding positions in Product Management, Product Marketing and International Business Development. My current role is as Senior Product Marketing Manager for the product lines we call positioning systems. Effectively my position is to manage the messaging for systems that can be remotely positioned. This includes such iconic brands as Spectra and Esprit, and includes the new high-definition PTZ dome Spectra HD. SecurityStockWatch.com: What are the trends you’re seeing in HD video and how does Spectra HD satisfy these needs? Dave Stanfield: Customers are demanding end-to-end, high-definition IP video security systems, so that is clearly the direction the industry is moving towards. For Pelco, Spectra HD represents the final piece of our end-to-end HD solution so now our customers have access to a complete offering that includes megapixel fixed cameras, HD monitors and video management systems like as Endura and DS-NVs. SecurityStockWatch.com: We read with great interest in Pelco’s recent announcement that, “Early showings of Spectra HD to customers are creating quite a buzz from all who see it.” Care to elaborate? And, please give us an overview of Spectra HD “family” of products. Dave Stanfield: Thank you. We are indeed seeing a tremendous response to Spectra HD and sales are reflecting that interest. Ultimately, I think the buzz is because of the reaction customers have when they first see the image quality. Spectra HD is able to produce amazingly clear images thanks to an excellent imager/optics combination that yields up to 1280 x 960 resolution, (more than four times the resolution of a standard definition dome), and an optically corrected bubble that protects the camera. When you’re dealing with megapixel cameras you cannot overemphasize the importance of the dome bubble. These cameras are so sensitive the bubble effectively acts as a secondary lens that can dramatically alter the image. That’s why Pelco engineers worked tirelessly to produce a bubble that would neither distort nor reduce the 960p resolution of the camera. As for the family of products, Spectra HD represents the latest offering in the most robust and full-featured PTZ dome lineup in the industry. Today’s Spectra domes are the fourth generation of PTZ innovation. The family consists of a full range of IP and analog PTZ domes that feature a wide array of imager/optics packages and enclosure offerings designed for different applications and environments. SecurityStockWatch.com: Spectra HD would appear to be an excellent solution for all commercial verticals such as finance, healthcare, retail, among others, as well as education, corrections and, of course, the huge government market at the federal, state and local levels. Are there one or two success stories or “wins” you’d like to talk about in each of these target markets? Dave Stanfield: Really and truthfully you will find success stories in all of the critical security applications verticals you mention. An example of one project is at the headquarters of one of the most prominent banks in Latin America. The first phase of the installation is end-to-end HD. It features an Endura Video Management System with more than 1400 terabytes of video storage and over 3000 Sarix fixed cameras and Spectra HD positioning systems. The Spectra HDs are protecting the most critical areas of the installation including the public areas, helipads, and the executive entrances. Pelco was uniquely able to offer the full end-to-end HD system and Spectra HD is a critical part of the system’s success. SecurityStockWatch.com: It is safe to say that Pelco is one of the most recognized and well known global brands with a well established track record that has been built over many years. For those who may not be familiar with the history of Pelco – can you fill us in? Dave Stanfield: In the security industry, Pelco is the benchmark upon which all other manufacturers are judged. Serving the industry for more than 25 years, Pelco has built an undisputed reputation for innovation, quality, availability and customer service. The result is a fiercely loyal customer base that continues today. A few years ago Pelco was acquired by Schneider Electric, a global leader in energy management. This acquisition has resulted in a more focused attention to video security in the larger scheme of buildings management and has allowed Pelco to leverage the enormous global footprint of Schneider Electric. SecurityStockWatch.com: Let’s drill down a bit into the strength of Pelco technology. Please tell us about the Sarix technology platform, “bubble” technology and the analytics capabilities which comprise the Spectra HD Solution. Dave Stanfield: Great question. The Sarix technology platform is Pelco’s award winning IP camera platform. The concept behind it is simple: design the camera around technology blocks so that as technologies advance we can quickly and easily integrate those innovations without redesigning the entire platform. Spectra HD is a great example of this because we were able to take key technology elements from the Sarix camera platform and pair those with an entirely new imager/optics module. The result is a fully digital high-speed dome offering that looks, feels and operates like a Sarix camera and easily integrates into any system through a common API. I touched on the bubble earlier, but I think it important to stress the effect the bubble can have on image quality, especially as zooms reach their maximum limit. The fact is that most of our competitors have not done their homework when it comes to this critical aspect of delivering maximum image quality. Analytics is another area where the benefits of the Sarix platform are realized. Increasingly customers are looking for intelligent systems that do not have to be monitored around the clock. Video analytics is a technology that allows recording and/or notification of exceptions to occur without human intervention. 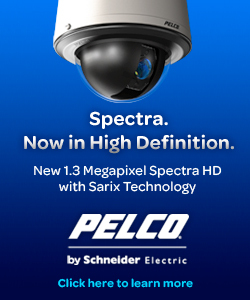 Because Spectra HD is built on the Sarix platform it can run the complete Pelco Analytics suites. Some of the most popular features allow for alerts to occur when people or vehicles are loitering in areas they shouldn’t be in, when objects are either removed or left in places where they shouldn’t, and many others. SecurityStockWatch.com: Congratulations on the recognition for Spectra HD by Security Sales & Integration magazine as a Top 30 Technology Innovation Winner for 2010. Any other reviews and/or product awards you care to mention? Dave Stanfield:Spectra HD is such a new product that we are in the very early stages of the sales cycle. The SS&I award was great news and we are all very proud of the engineering effort and the growing market acceptance of this new offering in the Pelco HD story. SecurityStockWatch.com: What resources such as case studies, “white papers”, and training are available for end-users and the trade at www.Pelco.com http://www.Pelco.com ? Dave Stanfield: I’m glad you brought up training because it is one of our core strengths as a company. Our PGTI (Pelco Global Training Institute) team is 100% devoted to educating our customers in the selling, installation and use of our products. As such, that team produces a full range of online training, site training and training classes at all of our offices around the world. We also feature a customer visit program where customers can visit the Clovis, California campus to see products being made, attend live demonstrations of our entire product range, and get a taste of the culture of customer service that has made Pelco by Schneider Electric the leader in the video security industry. 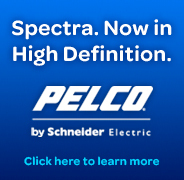 Additionally, I encourage your readers to visit www.pelco.com to get more information about Spectra HD and Pelco by Schneider Electric. They can also sign up to receive the Pelco Press, our company magazine filled with case studies and product information. SecurityStockWatch.com: Thanks again for joining us today, Dave. Are there any other subjects you would like to discuss? Dave Stanfield: Thank you very much for the opportunity to talk about Pelco by Schneider Electric, Spectra HD and of course all of the things that make us all very proud of our company, our culture, and our products.